[Update on Feb. 2, 2019] TaxACT used to be a lower cost alternative to the “big 2” tax prep software TurboTax and H&R Block. Lately TaxACT increased its prices quite a lot. Now it’s just as expensive and sometimes even more expensive than TurboTax and H&R Block. I will stop updating this post. TaxACT users should consider switching to TurboTax, H&R Block, or FreeTaxUSA. By request from a reader, I give a walkthrough for how to report backdoor Roth in TaxACT. If you use TurboTax, see How To Report Backdoor Roth In TurboTax. If you use or H&R Block software, see How To Report Backdoor Roth In H&R Block Software. If you use FreeTaxUSA, see How to Report Backdoor Roth In FreeTaxUSA. For backdoor Roth in general, see Backdoor Roth: A Complete How-To and Make Backdoor Roth Easy On Your Tax Return. For example when you are doing your tax return for last year, you report the contribution you made *for* last year, whether you actually did it last year or between January 1 and April 15 this year. You also report your converting to Roth *during* last year, whether the contribution was made for last year, the year before last, or any previous years. Therefore a contribution made in last year for the year before goes on the year before’s tax return. A conversion done during this year after you made a contribution for last year goes on this year’s tax return, which you will do next year. You do yourself a big favor and avoid a lot of confusion by doing your contribution for the current year and finish your conversion in the same year. Contribute for this year and convert it before December 31. This way everything is clean and neat. See Make Backdoor Roth Easy On Your Tax Return. You contributed $5,500 to a traditional IRA last year for last year. Your income is too high to claim a deduction for the contribution. By the time you converted it to Roth IRA, also during last year, the value grew to $5,550. You have no other traditional, SEP, or SIMPLE IRA after you converted your traditional IRA to Roth. If your scenario is different, you will have to make some adjustments from the screens shown here. The screenshots were taken for doing a 2014 return in 2015. In a different year you just advance the year. Wherever the screenshot says 2014, think last year. Wherever it says 2015, think this year. First we enter the non-deductible contribution to the Traditional IRA *for* last year. Complete this part whether you contributed for last year before the end of last year or you did it or are planning to do it this year before April 15. If your contribution last year was for the year before, make sure you entered it on your previous year’s tax return. If not, fix your return for the previous year first. 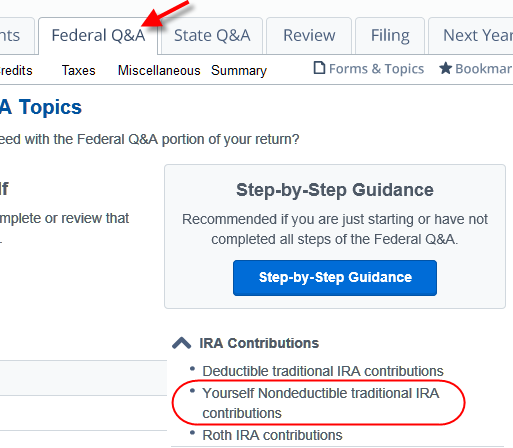 Under Federal Q&A, look for IRA Contributions in the right column and then click on Yourself Nondeductible traditional IRA contributions. Enter your contribution amount for last year. Enter your prior years basis from line 14 of Form 8606 in your previous year’s tax return or check the box for no basis. You get this quick summary. Repeat for spouse if applicable. Now we enter the Roth conversion. Go back to Federal Q&A. Look for Retirement Plan Income in the left column and then click on IRA, 401(k), and pension plan distributions (Form 1099-R). Click on Add to add a 1099-R. Fill out the 1099-R as you received it. Pay attention to box 2b, box 7, and the IRA/SEP/SIMPLE checkbox. Scroll down. Fill in your conversion amount. Leave the Prior Year Nondeductible Contributions box blank if you don’t have any carryover basis. Check it and enter the amount if you do. You are done with one 1099-R. Repeat if you have another one. Click on Continue when you are done. Just some general info about Form 8606. It asks about your prior years basis again. Enter it or check the box. Enter how much you contributed for last year between January 1 and April 15 this year. In our example it’s zero because we contributed before December 31 last year. The balance of all of our traditioal, SEP, and SIMPLE IRAs was zero as of December 31 last year. We didn’t recharacterize our conversion. Confirm the basis for our conversion. That’s it. Our refund came down a little due to the earnings in our conversion. Click on Forms on the top and open Form 1040. Scroll down on the right hand side to find line 15. It shows $5,550 in Roth conversion, $50 of which is taxable. Awesome. Thanks much for this! Could you put one up that shows how to enter a Mega Backdoor Roth? It should be a lot simpler. You start with the second part “IRA, 401(k), and pension plan distributions (Form 1099-R)” and add the 1099-R. Can you just enter it as-is and follow along? What does your 1099-R look like? This was VERY helpful. I use TaxActOnline and have been using it since 2006. I’m all squared away now for 2014 return. On seeing this, I realize that I have not filed any 1099-R or 8086 for prior years for my backdoor Roth contributions. All the IRS has is whatever Fidelity (who has my non-deductible and roth iras) sent them. What’s the easiest way to make this right? Do I need to go through and do 1099-X through the software or can I just mail manual copies of the forms to the IRS answering them the same way as illustrated above? What was the earliest year this loophole was allowed so I know how far back I need to go? I’ve been making too much since 2008 but I recall there was a 2 or 3 year period where the income limit was removed. 2010 was the first year. Fidelity has prior year tax forms online going back 7 or 10 years. Just log in and look for them. If you didn’t have any earnings when you converted, you can just fill out a Form 8606 for each year and send them in stand-alone. The IRS has prior year tax forms on its website. I didn’t have any earnings for any of the years. I have all the fidelity forms. Your illustration above (which I just followed for 2014 on TaxActOnline) shows also filling out 1099-Rs, do they need to be sent in standalone too? 1099-R is the form you receive from Fidelity, not one you fill out. 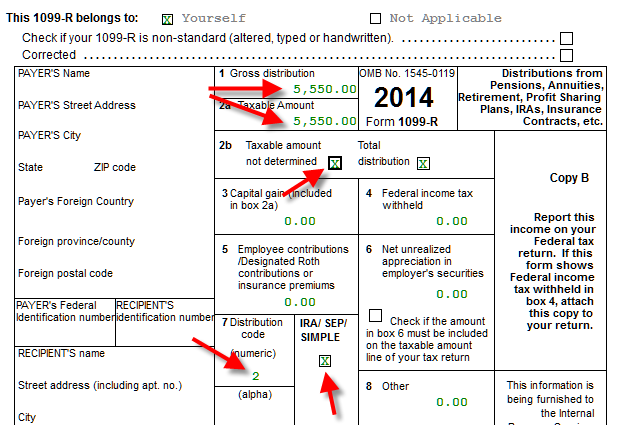 Entering the 1099-R into the tax software will put numbers on Form 8606, and on the main 1040 Form line 15 a and b. If you didn’t have earnings your 15b would be zero, which doesn’t affect the amount of tax you pay. You decide whether you want to be thorough and amend your returns to put a number on 15a or just wait to see if the IRS asks you about it. Thanks for the prompt responses and for your blog in general, of which I’ve been a fan for many many years. Also signed up on Personal Capital through your link. I’m currently receiving RMDs, so I assume I can do a backdoor Roth once, but I can’t make any further contributions for Step 2. Also, my 1099-R will show a distribution code of 7 in box 7. I will perform the rollover into my 403(b) plan, which will accept the rollover. My question is how to elect the distribution from the traditional IRA to be pursuant to the special rule allowing rollover of the pretax portion only, and how to show that using TaxCut. I don’t see anywhere that the fact is recorded that the distribution and rollover is the taxax portion only. There is a statement in PUB 590-A (2014) at the bottom of page 24 “If you rolled over the distribution into a qualified plan or you make the rollover in 2015, attach a statement explaining what you did”. However, there is no way to attach a statement using TaxAct and still perform electronic filing. There’s no election. Everything you roll over to the 403(b) by definition is pre-tax dollars because there’s no way to do otherwise. Your statement basically says on such and such date I rolled over $X from my traditional IRA to my 403(b) plan account. Not being able to e-file is not a big deal. Just print the forms, attach the statement and mail them in. Just an FYI, saw an Enrolled Agent. Now that TIRA balance is 0, doing this every year is going to be painless. Thanks again for this site!! Max- If your tax is prepared by your EA, do you still submit it from TaxAct? Do you submit a verbal statement or explanation? It seems to be required for a backdoor conversion by IRS PUB 590-A (2014) at the bottom of page 24 “If you rolled over the distribution into a qualified plan or you make the rollover in 2015, attach a statement explaining what you did”. Bob – he is going to submit it for me (electronically). He said I could send a paper copy (he printed it all out for me), but he is going to do it. Also, this is not considered a “rollover” (e.g., from 401k to rollover IRA). This backdoor is considered a “conversion”, so I do not think you need to explain why. I haven’t seen a need for this from the research I have done (this website and other sites).. Thanks this was very well laid out and informative. I do a have a follow up question on a different scenario related to this. So I did the backdoor last year in 2014 before April 15 for 2013. At that point I did have pre tax amounts in my IRA (precontribution to the IRA) . I contributed to my IRA and and rolled over to my Roth at the same time (within a day or two), this resulted in a taxable event (proportionate) where my pre tax IRA money got partly converted to the Roth IRA. How is this handled in Taxact. Apologies if this sounds convaluted and I have not explained this well. Hi, I’m hoping you can help me clarify something. I made a traditional ira contribution for myself in 2014 for 2014. Unfortunately, my conversion to the Roth IRA did not go through until 2015. How should I be reporting this on my 2014 tax return? Also further complicates things that I did a backdoor roth for my husband as well, and I was able to complete all the steps for his in 2014. We are filing jointly, and I am trying to understand how our 8606 forms will look different. KL – The “What To Report” section addresses that question. Each person gets a separate Form 8606. Hmm, I made contributions to my 2014 IRA in 2015, but did not get asked anything about “Post 2014 contributions”, as you’ve shown above. The basis for prior years was zero though, so maybe that’s okay? Would be great to know. Nice review, thanks. One thing that I get is TaxAct reporting that I made excess contributions to the IRA and Roth IRA because my allowed limits were 0. The 8606 looks correct and reports the taxable contribution as 0 so I think it’s just TaxAct worrying about nothing? Your allowed limits were 0 if you didn’t have earned income or you were over 70-1/2. Make sure you entered your W-2 and your age. Look at your 1040 line 59 or Form 5329 to see if you are paying an excise tax on excess contributions. If so you need to fix it. I have a question regarding NONDEDUCTIBLE IRA. I contributed $5500 to ND IRA for the year 2014 in March 2015. Then in the same month (March 2015), I converted that ND IRA to ROTH IRA. Now when I file taxes for 2014, I understand I can still report this ND IRA but can I report this Roth IRA conversion also in 2014 filing or I should report this in 2015 Tax filing. If I report the ROTH in 2015 filing, how will IRS know that it is for the ND IRA and not regular IRA so they dont tax me on that. (at converted the total $5500 to Roth IRA and no appreciation in ND IRA before I converted to Roth). Please let know. Thanks. Already covered in the “What to Report” section. You carry the basis to the next year. I was pretty new to the backdoor conversion concept this year. I contributed $5.5k to traditional IRA in Jan 2015 for the year 2014. Within a week or so, I converted all that to Roth IRA. Vanguard never sent me a 1099-R. I have a form 5498 from vanguard that shows the contribution to traditional IRA but shows the conversion amount as zero (even though they did convert all $5.5k to Roth account as 2014 contribution). I filed my taxes with Taxact earlier this year and I just noticed that the conversion is not reported on my 8606. What do I do now? You will get the 1099-R in January 2016 because you converted in 2015. Nothing to do now but if you continue this pattern you will get yourself more confused. See Make Backdoor Roth Easy On Your Tax Return. Thanks for the clarification that the 1099-R will be available in 2016. But shouldn’t the line 8 of 2014 8606 have the full value $5.5k because I did convert the traditional Ira to Roth? (Note that I didn’t have any change in value between my contribution and conversion.) I filed taxes using Taxact and I’m certain I followed the steps very carefully. MG – No, because you didn’t convert in 2014. Read that line 8 and the linked article above carefully a few times. If you start doing it the easy way you won’t be confused like this. Does this total include traditional ira, non-traditional ira, employer 401k converted rollover IRA, roth-ira or roth-ira is excluded from this total. Exactly as it reads. Roth IRA is not included. Very helpful post, as it basically summarizes hours of stuff we otherwise had to research on our own. But I have a follow-up question similar to MG’s. Overall, I followed your advice (without having seen it), but what appears on our TaxAct is different from how our accountants have previously done it. My spouse and I each made a 2015 nondeductible contribution of $5500 to a traditional IRA in early 2015. Several days later, we converted the full amounts ($5500.04) to Roth IRAs. I entered the information as you suggested above (just double-checked it) and see the conversion amount is reflected in Part II Line 16, but, as MG asked about, not in Part I Line 8 (that’s actually what I was searching when I got to your site). We were expats for many years and our Big 4 accountants always reported the conversion on both Line 8 as well as Line 16 (since our 2012 return, I think), as did our big-city local accountants last year. I see also that the IRS Form 8606 label for line 8 says, “Also enter this amount on Line 16” which suggests that the two lines should show the same value. I could not, for the life of me, figure out what interview question or Quick Entry value would get a value to show up in Line 8 (and then dribble down through lines 10-12). There’s obviously no tax impact, but given that what I’m seeing on my form appears to disagree with both my prior returns and the IRS instructions, I wondered if there is anything I could do to correct this. Any suggestions? It doesn’t matter. When you converted all your traditional IRAs, there’s a special shortcut that takes you directly to part 2, bypassing some lines. Your CPAs didn’t take the shortcut. Either way works. I did some additional poking around and found several threads on bogleheads that cover basically the same ground (and the fact that TurboTax and TaxAct both treat Line 8 this way) – with several posts referencing your site and several citing IRS Publication 590-B page 14 and worksheet 1-1 which provides the “shortcut” that essentially allows you/the tax software to skip lines 6-12, for anyone interested in digging further. I definitely feel a lot better having read all this. Thanks for the original article and for the speed reply! P.S. I emailed the TaxAct support email the same day I emailed you. I just got back their reply which I’ve quoted below. I saw a lot of hypothesizing on Bogleheads re: the “shortcut” used by tax software, and the notes below specify/confirm how they are doing it. Since so many threads on this topic lead here, I thought I’d post it for anyone else who lands on this page with the same question. Please see below for the explanation as to why there is not an entry on line 8 of Form 8606. If you have both a distribution from an IRA and contributions to an IRA in the current year, which may not be deductible because of your income level, you will need to use Worksheet 1-1 from IRS Publication 590-B , page 15, when completing Form 8606. This worksheet parallels and replaces the calculations on lines 6 through 12. The TaxAct program will automatically populate this worksheet if it is needed and you will see asterisks next to lines 13 and 15 indicating that the Publication 590-B worksheet is being used. Thank you for using TaxAct. Please let us know if you have any further questions. This was very helpful. I panic’d a bit when I got taxed for the 5.5K distribution and the google search lead me to this article and it saved the day. I have correctly followed your procedure and the accounting of money looks correct. And Part II line 16-18 are correctly filled but it says that if you filled Part I carry over the values from line 8 for line 16 and from line 11 for line 17. So that makes me wonder even more as to why Taxact didn’t fill out lines 6-12 to begin with. Maybe once the money flow is correctly accounted for these details dont matter much. But wanted to get your thoughts on this. Aba – See comments from LL right above yours. I’ve been using TaxAct Online since 2006 and doing the backdoor roth each year since it’s been allowed. I never realized I had to file anything extra with IRS for this. I used this page to cover my 2014 and 2015 contributions. But I’ve been utilizing the Backdoor Roth method for the prior years as well (I think since 2010 or 2011). Anyway, IRS hasn’t audited me or asked questions. Do I risk anything by just doing this going forward? I mean, I’m not going to take out of this until at least age 59 and I’m only 35. 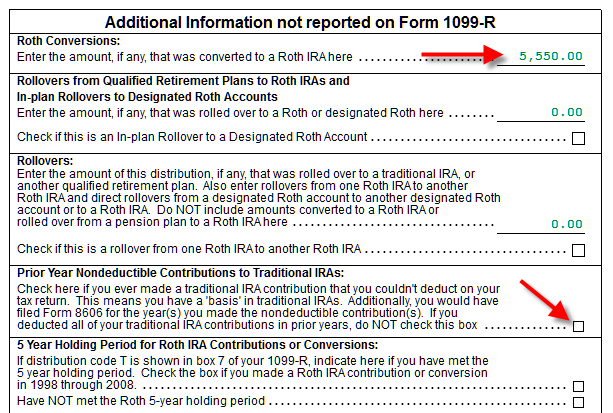 Each year when you converted to Roth, you received a 1099-R. That didn’t prompt you to enter it into TaxACT? If you entered it, without a matching non-deductible contribution, TaxACT would’ve had you pay tax on the conversion. Take a look at your past tax returns and see how much you declared as taxable (Form 1040 line 15b, as shown in the article). Maybe you paid more tax than you really owed. No. I neither entered it nor the matching non-deductible. Just did the mechanics of it each year. Never had any money in a traditional IRA either. Maybe I’ll give the IRS a call later this year after the busy season and see what they say. Just curious if anyone knew what might happen or if there’s any way I could get screwed from those errors if uncorrected. Haven’t heard anything from the IRS yet. If the IRS computer sees the 1099-R and that you didn’t declare it on your tax return, it might ask you to pay tax on it. So far it hasn’t, but it might. You can preempt it by filing the 8606 forms for each year retroactively (look for past-year forms on IRS website). Check the box if you ever made a traditional IRA contribution that you couldn’t deduct on your tax return. This means you have a basis in traditional IRAs. You would have filed Form 8606 for the year(s) you made the nondeductible traditional IRA contributions. If you deducted all of your traditional IRA contributions in prior years, do not check this box. I currently do not have anything in a TIRA. Everything has always been either a standard Roth IRA or a backdoor conversation. Since I technically did make a TIRA contribution that I couldn’t deduct on my taxes (and then converted to Roth as a backdoor), should I or shouldn’t I be checking that box? If you contributed for the previous year, check the box. If not, don’t. 1. I contributed non-deductible IRA $5500 in 2015 without converting it. 2. I rolled over my remaining $5000 IRA to company 401K in 2016. I got a 1099R with code G.
3. I contributed another $5500 non-deductible IRA in 2016. 4. I did a roth conversion for $11000 in 2016. But taxact puts $16000 as total distribution on line 5 of Worksheet 1-1. This results in a portion of the conversion as taxable. My question is whether it should include the Rollover $5000 on line 5? My understanding is that it should not. But google did not give me an proper answer. It should not. Go through the interview on the $5,000 rollover from your IRA to 401k and double-check your answers. I did check many times. The form itself is actually not that complicated. I even called taxact and they could not figure out what the problem is. Ironically at the end of the interview, taxact specifically mentioned on the page that this is not taxable and asked me to double check the amount. I also tried to remove the distribution for the Roth conversion. Then everything seems to be fine. But something cause a conflict when both appeared. I am thinking it is a software bug. I got worried at first because TaxAct started to show that I owed a bunch of taxes, but I hadn’t scrolled all the way down to see the “Roth Conversion” text box. Even TaxAct help was of no use and their FAQs do not lay this out. Ken Z and VictorB, I’m trying to do similar reporting in TaxAct. I had actually E-Filed, but TaxAct said a software fix was made and I had to try again. Before my numbers looked about right, and now it’s reporting that I owe a large amount. It seems that my 1099-R for the Rollover of deductible basis to my Company’s 401k is tripping up the calculation. I’m frustrated because I E-Filed weeks ago and felt good about it, and now it’s asking me to do it again! Did you ever figure out how to appropriately report these multiple 1099-Rs and the corresponding 8606? 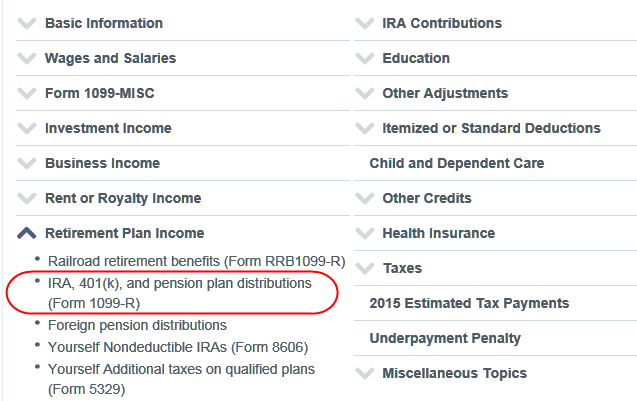 Line 5 is summing (PreTax IRA –> 401k rollover) + (NonDeductible Basis –> Roth Conversion). That impacts line 9 — showing a huge amount as income. For my wife’s 1-1, it’s showing the PreTax IRA –> 401k rollover on line 5, with the subsequent calculation on line 9 as well. But she didn’t have a Roth conversion, the net impact to the 1040 was 0. I did a partial parallel return in TurboTax online for our 1099-Rs and verified that the Backdoor Roth expected result was calculated, and not the huge tax bill as recently re-calculated by TaxAct. I luckily had saved a PDF of my (correctly calulated) return from a few months back and mailed it in instead of E-Filing the new return from Turbotax. Support has been useless and not responsive. This will be the last year of using TaxAct for me. That is exactly the same issue. And I agree. The support from TaxAct has no clue of what is happening. I spent quite some time with them on the phone and no solution was offered. I bet many people are in the same situation but did not pay attention to the details of the numbers and just paid the incorrect tax bill!! I contributed $11,000 to a non-deductible IRA in March of 2017 after our 2016 taxes were filed. And converted all of it to a Roth IRA within a few days so there were no gains. $5,500 was for 2016 and $5,500 was for 2017. I received a 1099R from the financial inst. for $11,000 to file for 2017 tax returns. I see how this is being done in tax act for the same year contribution and conversion, which makes sense and will do it that way going forward. But I’m wondering now how to record this in tax act and on the tax return? I’m hoping I can do it all on the 2017 tax return somehow and get this all recorded and taken care of. $5,500 2017 contribution – Enter in the same way as shown, except: enter $5,500 as the prior year basis and do not check the box saying the basis was zero. $11,000 conversion – Enter the 1099-R exactly as you have it. Check the box for Prior Year Nondeductible Contributions and enter $5,500 (that’s the $5,500 you contributed for 2016 in 2017). Would it be possible if you can update some of the screen shots? I’m using Tax Act for this year tax return and not able to view the Forms. Thanks for all your help! The screenshots were from TaxACT download software, not from TaxACT online. If you use the download software you will see them. Do I need to amend the return or just file form 8606 ? Just a warning to everyone – this is not working in TaxAct for 2018 as of February 3. The program hangs infinitely when you reach the screen to enter nondeductible contributions. I pointed this out to them 10 days ago and after much annoying back and forth with incompetent customer service agents it still is not fixed. I am near the end of my rope with them and about to either try a different online program or do it myself. I had the exact same experience as yours, and actually posted my question (without seeing yours for some reason). This is really bad customer service by TaxAct. I am researching other options for my tax return this year. Finally got a reply from TaxAct that there was a loop in their program, and this has been fixed. I tried it myself and it works out ok for me. We could use better customer service, but glad it finally got resolved. Looks like it has been fixed now. I was able to complete this in taxact a couple of days ago. Following these using TaxAct online and my fed and state taxes keep going up (i.e. when I remove this, the amounts due drop). What could I be doing wrong? Why is it “Taxable amount not determined” instead of taxable amount 0 for the Quick entry box? Hi! thank you so much for this! Question, after doing this, I’m still showing an income of a distribution, and I didn’t have one. Taxact is terrible to work with. What am I doing wrong? ?